The ACA was founded by experienced healthcare professionals that have worked in the caregiver field for more than 40 years. The primary role of the ACA is that of an educator of caregivers (sometimes called personal care aides) and managers for assisted living facilities. The ACA supports local and national efforts for seniors regardless of whether they are in an assisted living facilities or in-home care situation. There is an ever- increasing need for caregivers, and employers expect their employees to have national caregiver certification through the American Caregiver Association, the most recognized name in the caregiver industry across the United States. The American Caregiver Association is operated completely by volunteers and takes great pride in remaining steadfast and motivated through the strong leadership that our founders brought to the ACA in our collective effort to promote the well-being of our elders through compassion and education. As such, the ACA welcomes your comments and suggestions in helping us along this path. Likewise, we wish you all the best in your endeavors, in career and in life. The entire staff of the American Caregiver Association (ACA) is made up of experienced volunteers that have worked in every facet of the caregiver industry. As such, the ACA makes it our top priority to volunteer in the community in helping our seniors with the struggles and challenges that they face. Much of our work involves charity events and fund raising efforts to support the work that the ACA is doing to improve the quality of life for our aging community. It is our honor to serve those who hearts and minds came before us, and it is an equally great honor to be thanked by those that we try to help on our way toward the accomplishment of the Mission and Vision of the ACA. An integral aspect of the ACA's role as an association is to support caregivers and the profession of caregiving by helping to promote the importance of the job of caregiving. Another role we play as an the leading caregiver association in the United States is in raising the bar in terms of professionalizing the field of caregiving. One way we do this is by being the first and only organization to offer national caregiver certification. Both roles help bring awareness to caregiver issues as well those issues involving our seniors, which is where the focus should be. Membership has its benefits. As such, the ACA personally invites you to become a member of our association. The benefit of becoming a member of the ACA are far reaching in that first, your tuition is used to create awareness of both caregiver issues as well as the challenges that our seniors face as they age and ultimately live out the remainder of their lives in an assisted living facility. Membership with the American Caregiver Association is only $25.00 annually and is renewable in the month in which you became a member on the following year. Upon receipt of your membership dues we will send you a welcome letter that indicates your specific membership number and enter you into our directory of members. 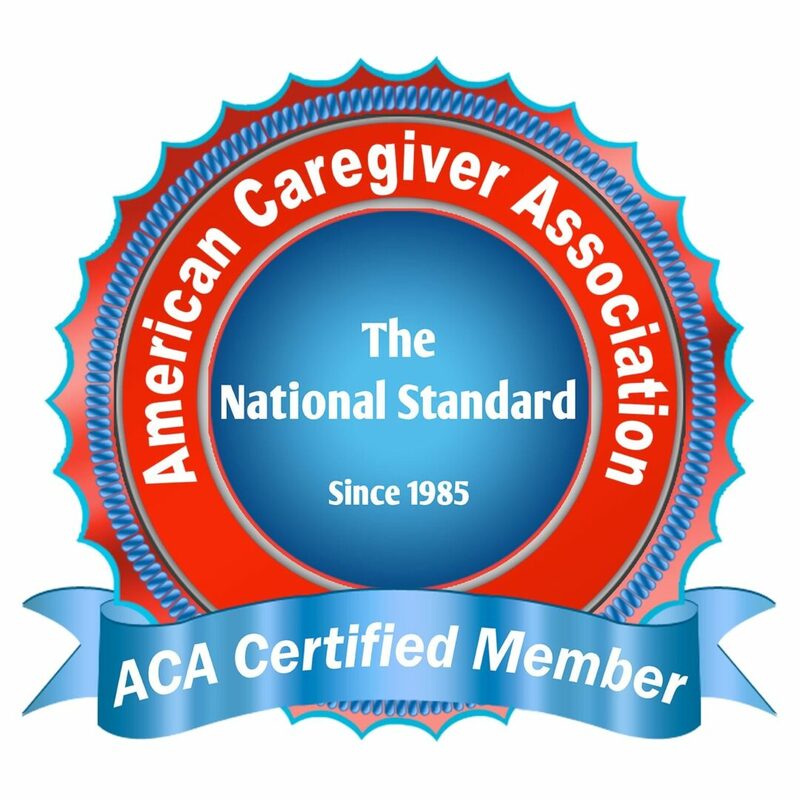 We will also send you a certified member certificate with our embossed seal indicating that you are a member of the American Caregiver Association. To become a member of the ACA visit our online store. Have you been asking yourself how to become a caregiver? Are you curious about how to become a certified care giver? Have you been looking for a caregiver certification course or a caregiver certificate? Have you wondered about how to become an elderly caregiver? Have you said to yourself, "how can I become a caregiver?" If you have asked yourself any of the above questions and have not been sure where to turn for information, you have found the right place! The American Caregiver Association is the National Standard for caregiver certification in the United States. As the national certifying entity for caregivers we are proud to offer national caregiver certification as a way to help you advance your career. As our elderly population continues to grow exponentially so to does the demand for qualified and knowledgeable caregivers, along with the continued requirements for caregiver certification at the national level. As such, acquiring caregiver certification on a national level puts you one step ahead of everyone else due to the name recognition, reputation and credibility of the ACA. Moreover, when you acquire National Caregiver Certification it places you above other caregivers in the field you are competing against for employment. National caregiver certification is the expectation and the requirement in the industry today. Therefore, we strongly urge you to keep this in mind as you look to advance your career in the health care field, and as a caregiver more specifically. Having our certification on your resume simply puts you ahead of the game now, and in the long term. The ACA is committed to providing you with the opportunity to become a nationally certified caregiver, and get a jump start on your career, or add to your existing resume/CV. In doing so, you also place yourself in a select group of caregivers that are setting the standard for the industry. Likewise, you help promote an improved quality of life for our seniors. Additional benefits of becoming a nationally certified caregiver with the ACA include increased status, potential for greater opportunity and the respect of those in the health care industry who believe that being a part of an organization like the ACA is critical to promotion and well-being of our seniors and the caregiver profession as a whole. After you complete any ACA caregiver course your name and unique student ID number are entered into our National Caregiver Registry (NCR), identifying you as a nationally certified caregiver with the ACA. Subsequently, when prospective employers or other individuals contact us to verify your status in the NCR we are able to confirm that you have completed our caregiver course and are a nationally certified caregiver with the ACA. To purchase our national caregiver certification course (NCCC) please visit our online store above, or go to our homepage. Good luck, and please email us through our contact link page at info@americancaregiverassociation.org above, or call us toll free at (800) 625-8108 should you have any questions.